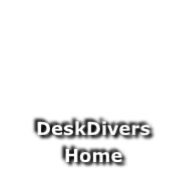 Deskdivers would like to thank Hakim and Henk Hoving, for their help with this article and also for the use of their pictures. Thanks also to Peter Taubman for the image of his Issued GSG9 (number 41) which was photographed by Ralf Beinenz. 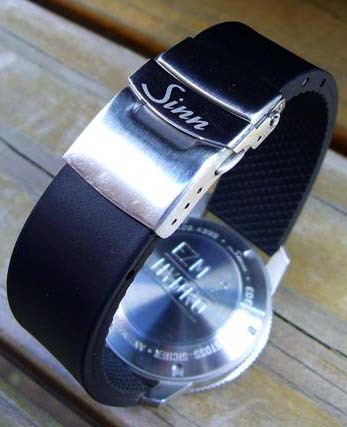 In the late 1990’s Sinn released a new line of watches with the EZM moniker. EZM stands for Einsatz Zeit Messer, which translates to English as Mission Timer. These watches were designed to be issued as tool watches to the German special police forces and each watch (EZM1 through EZM4) had different functionality to suit its intended special force’s needs. The range consisted of the custom special combatant (EZM1), the border guard diver unit (EZM2), the police special force (EZM3), and the fire fighting rescue unit (EZM4). Sinn used different movements (Quartz, Automatic) and different watch styles (Diver, Chronograph) to create this range of tough, non-nonsense watches - in this article we will focus on the EZM2. 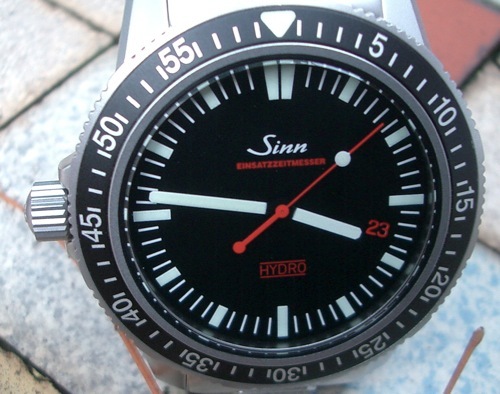 Sinn watches have long been known for their high quality functional watches and reasonable prices. The EZM2 personifies this perfectly. For this timepiece, Sinn decided to build a watch based on their existing 403 model which utilised a quartz movement (ETA 955.612) with 7 year battery life. Needless to say, this helped keep the price affordable, but don’t confuse this as some kind of cheap battery powered watch. The EZM2 is shock resistant and anti-magnetic and the case is filled with pure silicone oil thereby providing optimum visibility at any angle, especially when submerged. The oil also enables the watch to withstand depth pressures that would crush ordinary watches. Sinn calculate that the watch could withstand depths of 11,000 ft / 5000m, but instead they, and this is typically Sinn, mark the caseback simply with an understated ‘Waterproof’. 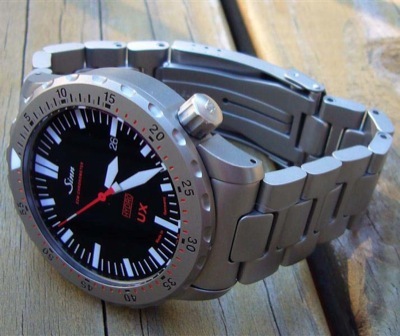 Make no mistake - this is a tool diver’s watch! The Stainless Steel case is extremely well made by case maker SUG (Sächsische Uhrentechnologie GmbH Glashütte) which was co-founded in 1999 by Lothar Schmidt who owns Sinn. Interestingly, Lothar Schmidt owns 74% of SUG now and when SUG was founded, Schmidt owned 24%, Walter Fricker 50% and Ronald Boldt 26%. Schmidt bought Fricker’s share when he left the SUG partnership. 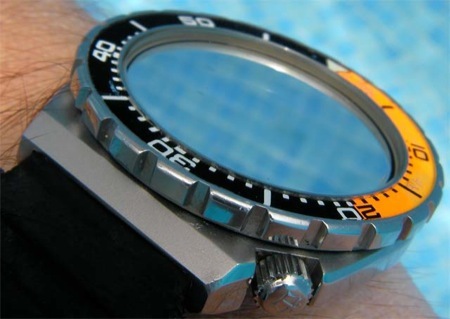 The light media blasting of the case is the perfect solution to avoid reflections underwater – It is thought sunlight reflections attract sharks and thus shiny watch surfaces should be avoided when diving. The blasting used on this case also seems to be more resistant to scratches and rub marks than other manufacturer’s media blasted finishes. 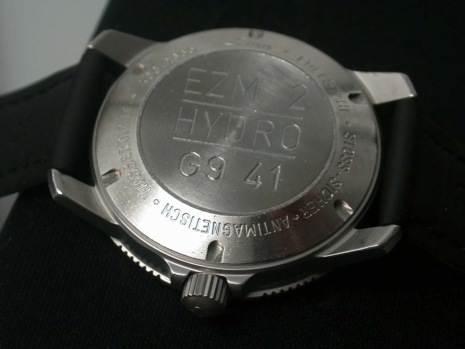 The screw on back is circular grained which seems slightly at odds with the blasted case finish and is engraved slightly offset with the words ‘EZM2 HYDRO’. Initially this offset engraving seems strange until you realise that to create the EZM2 Sinn essentially took a Sinn 403, turned it through 180 degrees and gave it a new dial. 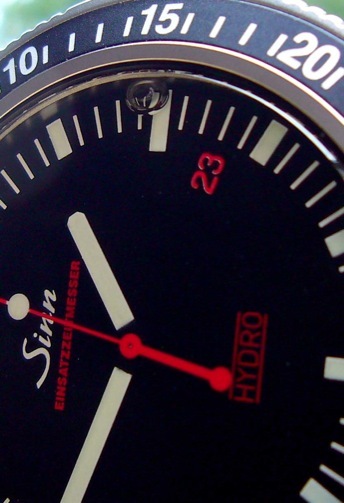 Obviously the CNC case back programme was already set up with the word ‘HYDRO’ and it seems Sinn just added the ‘EZM2’ above it. Between the lugs at 12 the ‘SUG’ logo is engraved and between those at 6 is the plug used when filling the case with the silicone oil. It has been reported that the process of filling the watchcase with the silicone oil takes 20 hours per watch to ensure all the space is filled and no air remains. One feature of this watch is that the crown that is located on the left side of the case, thereby making wrist movement easier. This is especially important for divers who need good wrist movement and also need to avoid snagging the crown on hazards whilst underwater. The crown is signed and screws in securely between its guards. Interestingly the diameter of the watch is 41mm which nowadays lies right on the border between the larger sized watches which are popular today (Panerai, UTS, etc.) and smaller sized watches of yesterday (Rolex Submariner etc.). This, and the low height of the watch, has the effect of making the watch very wearable in all situations. It is as easy to wear in an office environment under a shirt cuff, as it is on a weekend diving trip. The EZM2 is available in two bezel styles - A plain silver coloured bezel and a more common diving style anodised black bezel. It is understood that both are made of a Titanium base. Both are uni-directional, have 60 clicks and are easy to grip with gloves as the edge is slightly proud of the case sides. Naturally the use of a filled non-compressible watch means that even when used in Helium rich environments the watch is resistant to the typical problem of Helium ingress found with hollow watches. Helium molecules are much smaller than air and can be pushed past the seals on dive watches and even absorbed through the metal of the case. Hence many dive watches have an HEV (Helium Escape Value) to release this introduced helium during decompression. Failing to do this would mean that the extra pressure inside the watchcase would need to escape. Physics tells us that it would locate the easiest route and that exit is usually manifested by the crystal being pushed out of its seal or when held captive, shattering. With the EZM2 and its silicone oil, the absorption and eventual release of helium is so slow and in such minute quantities as to render this issue obsolete. The sapphire crystal is flat without a Cyclops to magnify the red on black date, giving the watch a very clean look. The uncluttered dial is typically Sinn and very easy to read at a glance with the red seconds hand and date numbers in matt red. This has the effect of distancing these features into the back ground until the user decides to focus their eyes on them. When underwater due to the colour saturation at depth, this effect is magnified and the Diver sees only the information they need and is not bothered by anything that is not pertinent to the job in hand. The hands and markers are coated in luminous paint but due to having to shine through the oil in the case, luminosity is less bright than other watches. 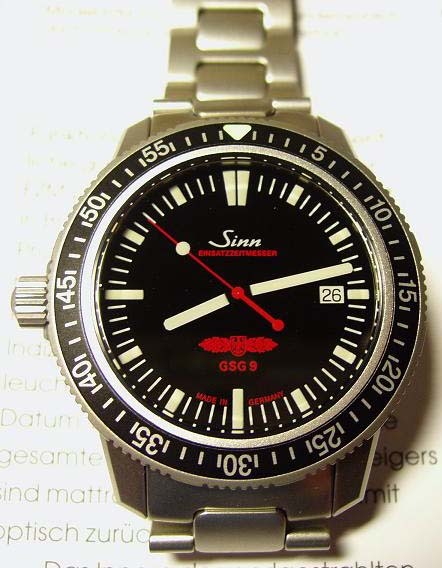 Even though the more common EZM2 was the ‘Hydro’ version (as written in red on the dial), Sinn also produced a number of limited editions either for, or to commemorate, the Maritime Unit of the GSG-9 (Germany’s equivalent to America’s S.W.A.T). The early GSG-9 version had a small GSG-9 logo and white date wheel at 3 o’clock, and the later small logo models were supplied with the red and black date wheel with the date at 4 o’clock. These later small GSG-9 logo watches seem to be the more coveted EZM2 among collectors. 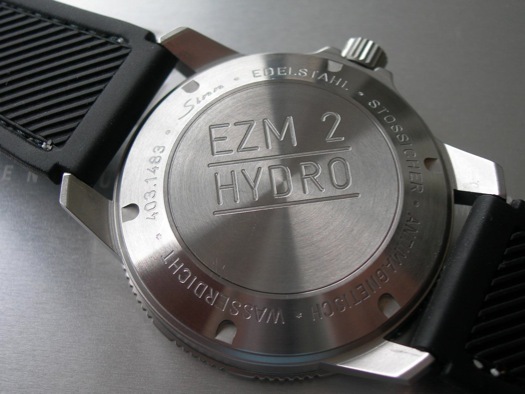 Another collectable variation of the EZM2 was the earliest version of the ‘Hydro’ model with “3H” on the dial, denoting that tritium coating was used on the hands and markers. 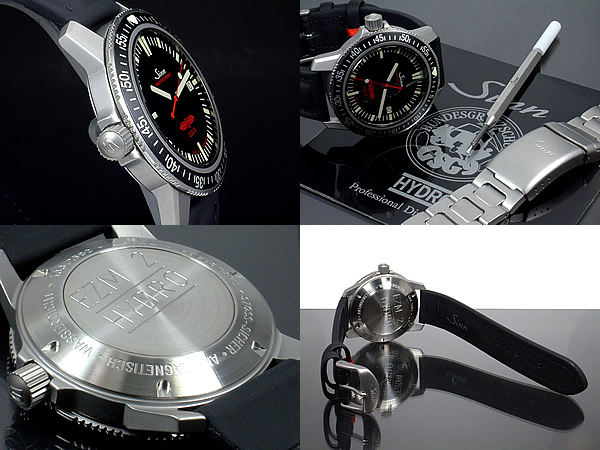 The final version of the EZM2 was the GSG-9 limited edition version with the no date and a large GSG-9 logo on the dial. This logo incorporates; at 12 o’clock two lightning bolts; in the centre at 3 o’clock a hand grenade; at 4 o’clock a telescopic sight ‘cross-hair’, horizontally between 5 and 7 o’clock is the GSG-9 logo; vertically from 12 to 6 o’clock is a sword; horizontally between 4 and 8 o’clock is a Trident; in the centre at 9 o’clock a parachute. 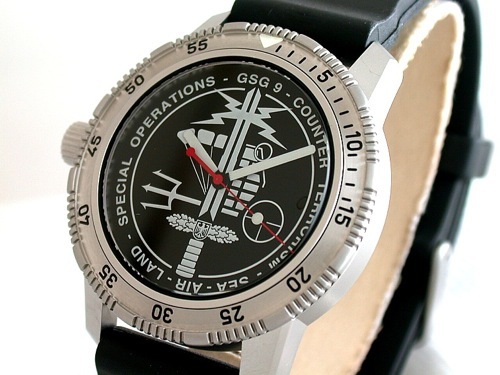 The dial also has the words “GSG 9 - Counter Terrorism - Sea - Air - Land - Special Operations” around the outer edge, It is too soon to tell if this will become a collectable model but currently most WIS feel that this logo spoils the dial design as, together with the lack of indexes, it makes the watch less legible and is at odds with the tool design elements of the watch. 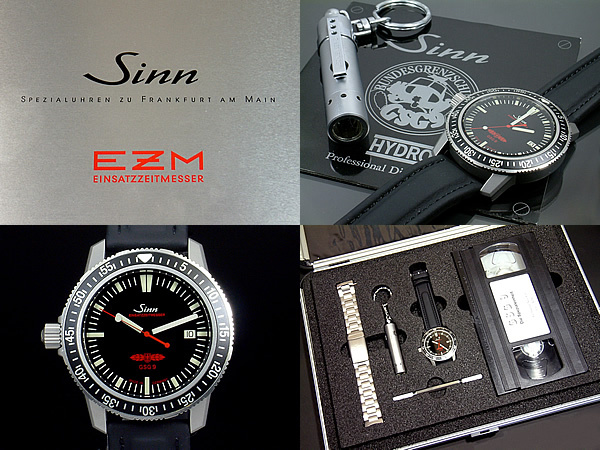 The Hydro versions of the EZM2 were supplied in the typical Sinn black leather type inner, and black card outer, Sinn branded box set with operating instructions (CD with later purchases) and warranty card. The GSG-9 versions were delivered in a special aluminium attaché case box set. 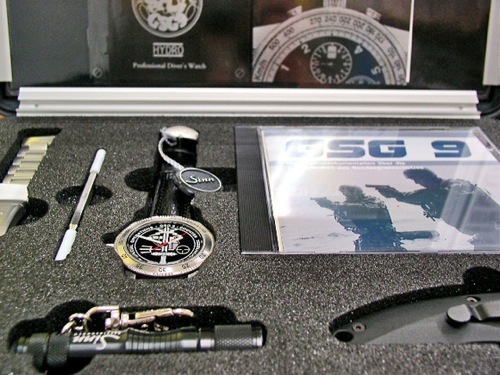 This set would appear to have been available in two iterations; The earlier (supplied with the early versions of the small GSG-9 logo model) came with a bracelet, sharkskin strap, strap change tool, keyring style LED mini flashlight and a Video about the GSG-9. 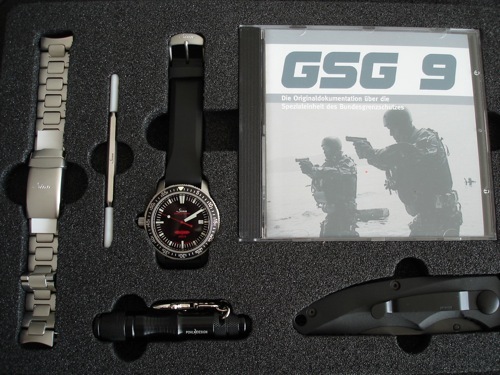 The later (late small GSG-9 logo and all large GSG-9 logo’d dials) version used the same attaché style case and the set included a GSG-9 DVD, LED flashlight, folding knife with ceramic blade, bracelet and sharkskin strap and a strap change tool. 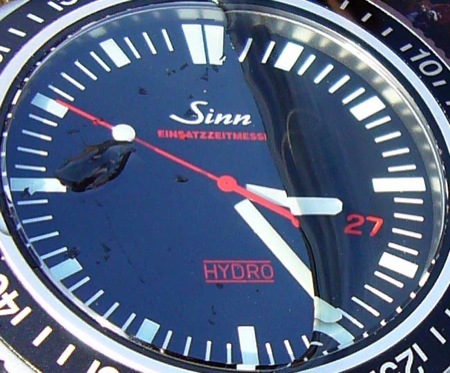 The Hydro version of the EZM2 was originally available in two variations at point of sale – either with strap (rubber or leather/shark) strap or with a bracelet. 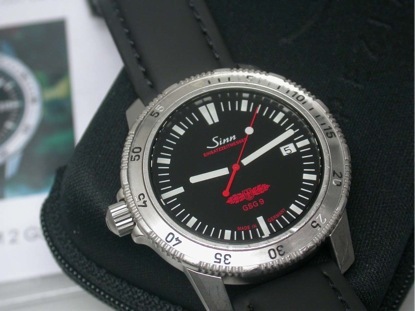 Both the bracelet and strap (rubber or shark leather) are still available from Sinn. The bracelet is a great fit to the case and is smooth and easy to adjust. The later versions had solid end-links and screw links to size the bracelet. The clasp has three additional micro adjustments and the divers-extension folds nicely into the clasp when not in use. The clasp feels solid and features a safety lock to prevent opening although, like all Sinn bracelets, it does not have an indent for your thumb nail to aid opening, which seems at odds with Sinn’s functional design ethos. Due to the oil filled case, changing the battery in these watches should not be attempted at home or even by the local battery change kiosk, instead the watch will need to be returned to Sinn in Germany. 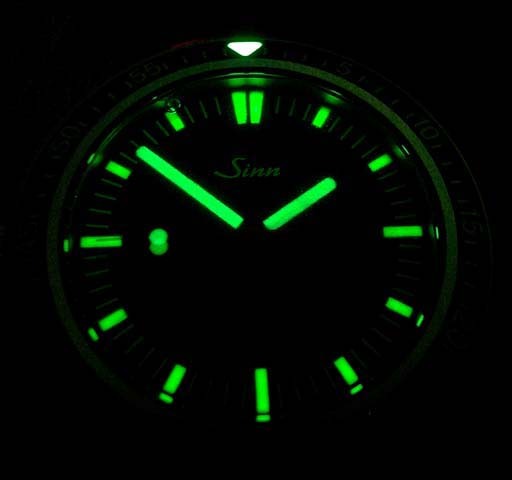 At that time Sinn also undertake to replace the dial and hands as the silicone oil is corrosive to the luminous material and after the life of a battery (approx. 7 years) the luminous properties will be past their best. One issue with this is that the early, hence collectable, ‘3H’ marked dial is often replaced with the later non-3H marked dial. It is understood that this earlier dial is now discontinued and Sinn may leave the original 3H dial on the watch during the battery change / service only by special request. As mentioned earlier Sinn have recently changed their oil formula and it is now ‘dial friendly’. 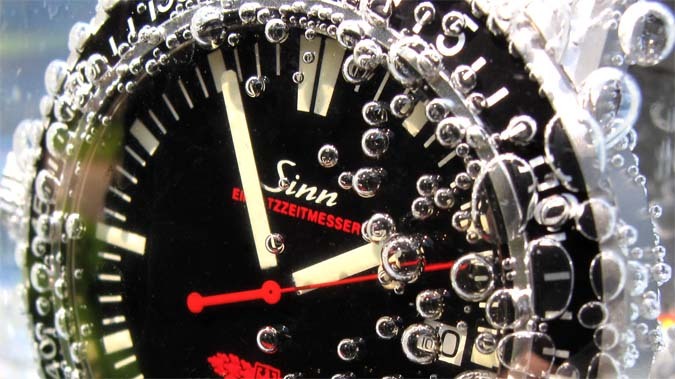 I received a lengthy, precise and exhaustive answer from Sinn concerning the question of the air bubble in the silicone-filled watches (403 Hydro, EZM 2 - both now discontinued - and UX/EZM 2B for Sinn, but also Bell&Ross Hydromax). - Any oil will absorb dissolved gases. - When a watch case is filled, there is no gas bubble. - As the ambient temperature drops, the oil filling contracts more than the volume of the watchcase. This phenomenon is compensated to a degree by the membrane back of the watchcase. - When the membrane reaches the end of its flexibility, however, a vacuum bubble forms in the oil. - The vacuum bubble is progressively filled with dissolved gases from the oil, and also with air which continually diffuses into the case (no wristwatch is completely air-/gasproof). - As the ambient temperature increases again, the pressure inside the watch increases as well. The oil re-absorbs some, but not all of the gases in the gas bubble. This is because due to the diffused air, the total mass of the filling is more than it was before the ambient temperature dropped. - Especially as this process is repeated, a gas/air bubble can form which is no longer dissolved as the ambient temperature increases. 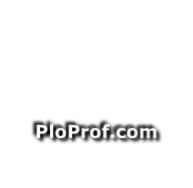 - To minimize the effect - or to prolong the time until such a bubble forms - the initial oil-filling is currently done at a slight over-pressure (by manipulating the membrane caseback). - The only way to get rid of the bubble, once it is stable at normal temperature, is to change the oil filling. - Needless to say, the bubble does not affect the functioning of the watch in the least. Please keep in mind that I have no technical expertise of my own, but that this is only a summary/translation of what Sinn are saying. Bezel colour and style is a personal choice but most agree that the black bezel suits the watch better. The luminous triangle is cemented in from above using a two stage glue and should not fall out of the bezel. 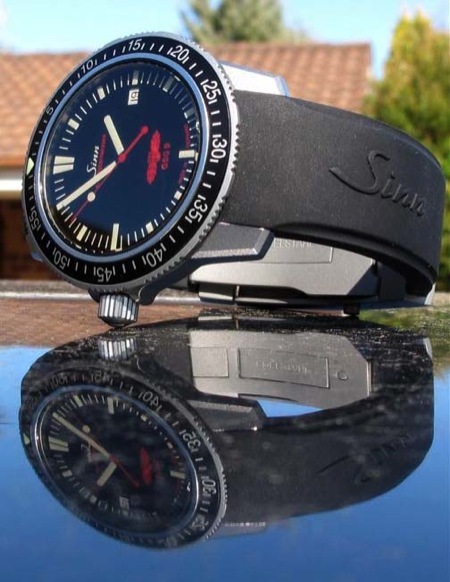 Strap options for the EZM2 were a waterproof sharkskin leather strap, rubber strap (latterly with a vanilla smell) or metal bracelet in the typical Sinn style. 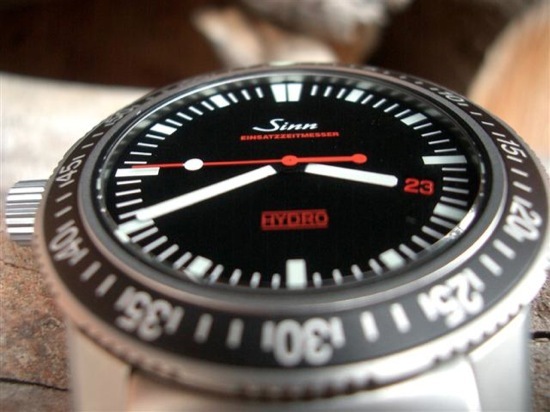 Deskdivers feel Sinn made a mistake to discontinue selling the EZM2 when the EZM2-B (or UX) model was released. The case size, form factor with left side crown, the high quality fit and finish and the cool silicone oil filling make this watch a highly usable tool dive watch. It is very comfortable to wear for all occasions and is great value for money. 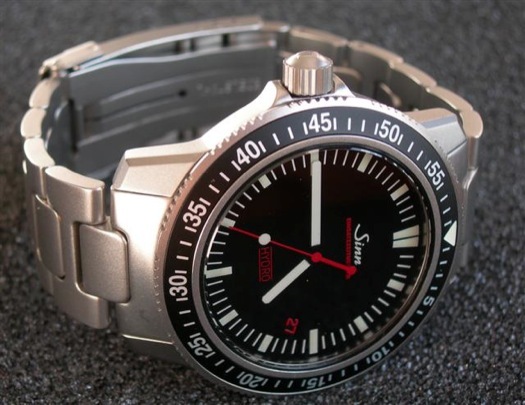 However, it is likely that Sinn, as a small company, simply could not justify having these two series run side by side and decided to move to the larger sized U series watches. Perhaps another reason to discontinue production was in order to limit numbers because of the the additional work required to change the batteries which could have a future impact on Sinn’s service dept? Although this is debatable especially as the new UX that replaced it is the same technology… and Sinn still produce and sell the 403. The final benefit of the oil filling is dial visibility when underwater. However, it also exhibits an uncanny phenomenon when viewing the dial in air; that of the hands and dial appearing to be much closer to the watch crystals surface than on a gas filled watch. This is due to the flattening effect of the oil surrounding the hands and dial, causing them to appear as a flat image. The human brain knows that the time display is a three dimensional object, but the eyes say otherwise, confusion occurs and the result is somewhat unreal. Once below water this unusual effect is negated as its proper purpose becomes clear, that of combating refraction. Any interface between mediums of differing densities causes refraction. This is a bending of light at what is officially termed ‘the boundary’ due to a change in the speed of light transmission at that point. In all cases of refraction there is a moment at which the angle of ‘bend’ combined with the viewing angle achieve what is termed the ‘critical angle’, at this point and at any past it the refracted light travels along the boundary creating a mirror effect (as illustrated in the middle image left where its possible to see that the light is travelling across the watch crystal rather than through it). This can also be seen in your home fishtank and will be familiar to anyone who has looked at a conventional gas filled watch underwater. The difference in the ‘refractive indices’ of air and water is relatively large, giving a shallow critical angle. However, the refractive indices of water and silicone oil are close, so very little refraction occurs at the boundary and the critical angle is therefore deep, giving the EZM2 effective immunity from the ‘mirror’ effect underwater. The design ‘Pièce de résistance’ of this watch is the Silicone oil that fills the watchcase. 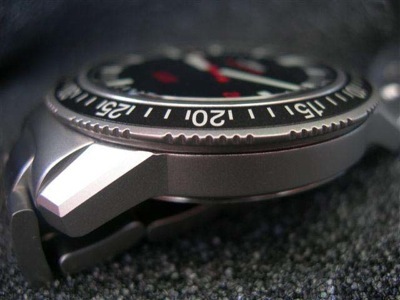 The use of a liquid to fill the voids in the case overcomes the main problem associated with building serious dive watches; that of pressure resistance. The pressure of the water surrounding the watch increases as the wearer descends into the depths during a dive. As this increasing pressure is exerted on a normal air filled (hollow) watchcase it will eventually cause flexing of some part of the case leading to a breach which will allow water to be forced in. At depth a failure is always immediate and catastrophic to a delicate instrument such as a watch. 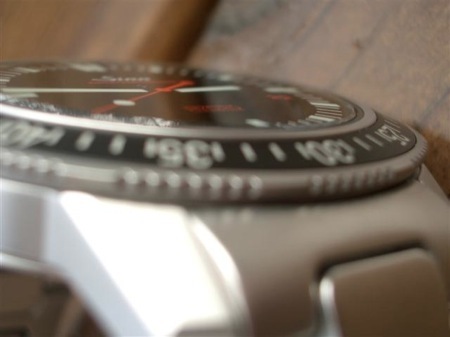 Today a watch failure is perhaps less of an issue since Professional Divers carry a number of computers and use their watch only as a back-up. In the early days when divers relied upon their watch as their one safety tool. At the very least the failure would mean an immediate return to the surface, ending the dive and wasting the investment in both time and money. At worst it could result in the death of the diver. Completely filling the watch with a practically incompressible substance essentially means that the case, movement and associated watch parts form one ‘solid mass’, with no possibility of any joint flex or deformation. This allows the watch to achieve a vast depth rating, some would say 'infinite' as there isn't an ocean deep enough to empirically test it to destruction. It has to be wondered what would be the point of such a test, as the diver would perish long before the watch. In the case of the EZM2 the watch is rated to 5000m as that is where it is considered by Sinn that the movement would cease to function, because of course certain components such as the battery and quartz crystal enclosure contain air and would eventually be crushed. Another factor is that the silicone oil will increase in viscosity with pressure, so could eventually be too ‘thick’ for the hands to move. The aesthetic advantage of the oil filled system is that it eliminates need to use a large, thick and heavy case. As seen on almost every other tool dive watch in order to provide the strength to resist water pressure. Instead, the oil allows the parts to form a single solid unit as all parts become 'load bearing' and the case can be of a slim design. Given all these advantages, it's easy to consider that oil filling is the perfect answer to the age old problem of pressure resistance for all watches. However, it should be noted that this system can only be used with quartz movements as their moving parts are driven by a small stepper motor. This motor is blessed with considerable torque, relative to its size, which allows the parts to push their way though the viscosity of the oil. 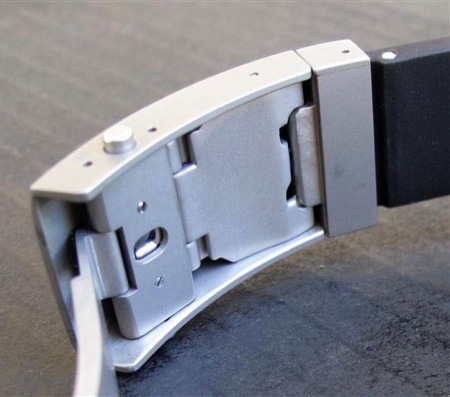 A mechanical movement would not be able to achieve this as it generates lower torque, contains many moving parts all with very fine tolerances requiring minimal drag to function. 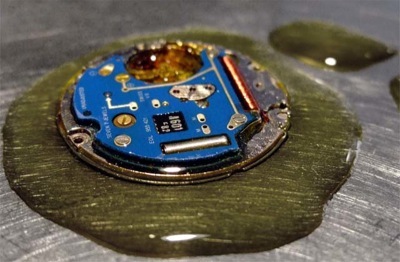 Immersing these parts in oil would mean that they would run very slowly, if at all. 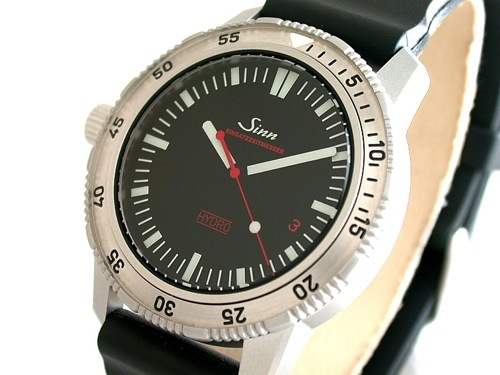 Sinn experimented with a number of different types and grades of oil and now utilises a formula that does not cause problems with the luminous paint on the dials, as this was an issue with early models. All battery changes from 2007 use the new oil. Over the years Sinn has provided a number of strap options for these watches. Whilst Sinn could supply any of their range of 20mm leather straps for use on the EZM2, the most obvious strap choice on a dive watch is rubber. Early rubber straps with the deployant buckle were simply rebranded Chinese straps with a light laser etched logo on the buckle. Sadly, this strap looked and felt what it was; cheap. Sinn quickly moved up a gear and the next strap was a two piece slim (1.5-2mm) rubber strap with the standard high quality Sinn buckle from the leather straps range. 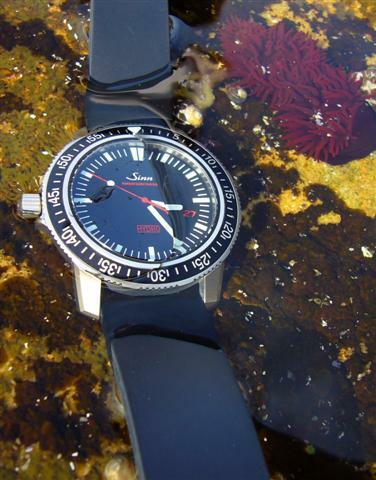 The slim two piece was later joined by a longer and thicker (3mm) strap more oriented to diving. It was also a generic strap from the aftermarket and was vanilla scented and had beveled top edges. 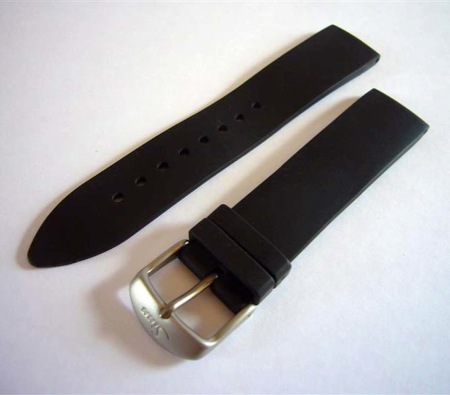 Whilst the straps were steadily improving, those straps were trounced in later years with the introduction of a new strap based on those of the U series models. 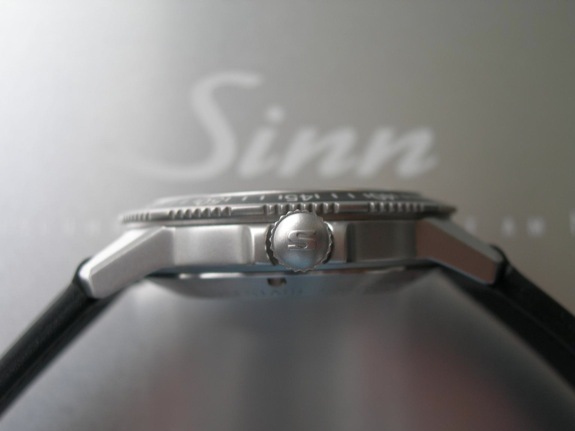 This is a dedicated 4mm thick branded Sinn strap and uses rubber ends that are cut to fit the wearer. These ends fit into dedicated 20mm versions of the U series clasps, either a neat double deployant or larger Z style with diving extension. Sinn’s cessation of production in 2006/7 with the arrival of the UX, was not quite the end of the EZM2 story. 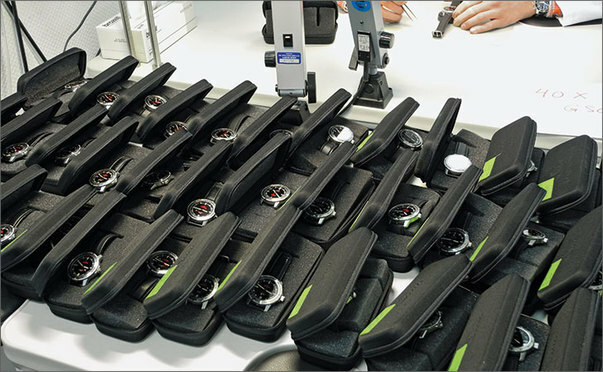 In October 2011, 40 refurbished watches were released to the market via the German retail chain Manufactum. Whilst refurbished watches don’t generally excite collectors, these watches were very exciting indeed as they were those originally issued to the GSG9 maritime CT (GSG9/2) unit in 2001 which had been returned in 2009 when the unit was issued with the UX models. These special watches were fully serviced by Sinn with fresh oil and batteries and at the same time some reconditioning was undertaken. This comprised the fitting of new crystal and crown, along with new dial & hands. The latter most likely as the older spec oil formulation would have attacked the luminous material on the original parts. Whilst the watches are thought to not have borne any GSG9 logo when originally worn by the GSG9, the new dials fitted were of the GSG9 small logo version, perhaps with the view that by having the GSG9 logo it spoke of the history of these watches. The case and bezel were not refinished to retain evidence of their issued ‘life’. The watches not only exhibit case and bezel wear, but also bracelet end link marks on the lugs. These cosmetic wear marks meant that Manufactum decided not sell the watches online as they felt that buyers should be able to assess the cosmetic damage before making the decision to purchase, thereby also avoiding hassle of any returns due to wabi. The case-backs bear the engraved issue numbering of ‘G9 nn’, where nn is the number of the watch. It is worth noting that there were originally more than 40 EZM2s issued to the GSG9 but only 40 were sold at this time. Possibly the others were rendered unsuitable for sale due to excessive damage or may have been lost in the line of duty(!). 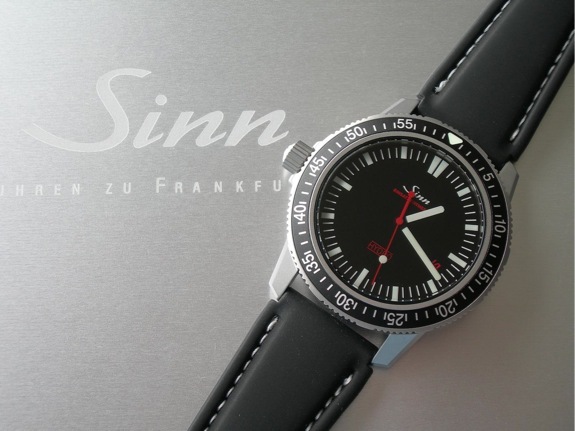 The watches were delivered in a standard Sinn service case and supplied with the plastic Sinn warranty card handwritten by each Manufactum store along with printed instructions in the usual Sinn CD sized clear plastic wallet. Naturally demand was very high for these watches and all 40 sold out quickly at the several Manufactum locations that stocked the watches. Sales were on a reserve list lottery basis and the price was 1150 euro. It would seem that Manufactum were somewhat overwhelmed by the response to these ‘old used watches’. For example, its is said that the Frankfurt store had over 160 names on a list for their allocation of just 5 watches. Looking at the relative rarity of EZM2 models, these 40 issued watches are the most sought after of these watches, followed by the ‘non issued’ GSG9 model, which Sinn sources say number around 500 across all the editions.